This pet is available for purchase during the Mists of Pandaria Timewalking Bonus Event. 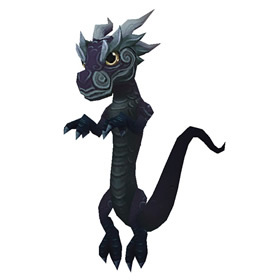 This P/P dragonkin can almost mimic the P/P infinite whelping. Except for her second slot. Temporal Analomy, as @Vakeetah so elequently points out it adds a twist to Early Advantage. At first, I thought Roar was a strange idea, but couple a 25% increase in damage in tandem with the dragonkin racial ability, it can be deadly. With only 1400 health, a slow 244 speed, and no way to heal herself, she is a glass cannon. Timed correctly, she could take out a magic pet in 2 rounds. This little guy offers the very interesting combination of Temporal Anomaly and Early Advantage. The classic problem with Early Advantage is how the second tick works, resulting in it being to predict and calculate, or risking death due to low Health on top of being slower. Thanks to Temporal Anomaly you can have a mostly-passive Speed advantage, making Early Advantage more reliable even at low Health levels, which can also stack with Dragonkin for INSANE damage to a fresh, full HP pet. The base speed is 5.5 what translates to 243.75 ingame. Assuming that the values during an interaction are not rounded, for a personal advantage the original targets' speed should be < 325; exactly 325 makes the pets equal. That makes it rather disappointing against most of specific enemies, unless you plan to support other members. Still, a speed equality seems to disrupt speed-based advantages in both ways. Being a P/P breed, self-buffed with Roar and using Tail Sweep, one could crank out some massive damage. Cyclone with a P/P can also do some serious damage to the entire enemy team. Early Advantage could be situationally amazing as well, since this pet has no bonus to HP.